When it comes to launching and promoting games, there are a myriad of other differences that need to be understood. One of the biggest is how the social media landscape in China is dominated by a trio of companies - Baidu, Alibaba and Tencent, or BAT for short. Charles Xi is executive chairman at NativeX. With an increasing number of non-Chinese developers and publishers wanting to launch games into the Chinese marketplace, the differences between China and other countries are often reduced to differences of language and culture. In fact, when it comes to launching and promoting games, there are a myriad of other differences that need to be understood. One of the biggest is how the social media landscape in China is dominated by a trio of companies – Baidu, Alibaba and Tencent, or BAT for short. We may think that this is no different to the way that Facebook, Google and Twitter have become the social platforms that we all talk about every day. But the influence of the BAT trio is far more wide-ranging thanks to the fact that each offers a multitude of integrated products and services that people use every day. Whereas Facebook has effectively consolidated social networking through a combination of growth, acquisition and innovation, Chinese social networks have flourished within niches, which means that they often complement each other, leading to much greater fragmentation than in the West. Of course, the fact that Facebook and Google are currently unavailable in China means that, apart from new domestic challengers, there is little risk to BAT in the short-term – but the rise of these three shows that Chinese consumers will rapidly embrace new products if they offer the right mix of utility and entertainment. When it comes to launching and promoting mobile games, these three companies account for around 90 per cent of the programmatic advertising in China. Because of the relative lack of third-party data management platforms (DMPs), these companies have an immense amount of proprietary user data that they can leverage. Of the three, Tencent is the biggest and most popular. Its primary social platforms are QQ, which started as a messaging and microblogging service but has grown to include games, video and e-commerce; and WeChat, ostensibly another messaging app, but one that’s become ubiquitous throughout China for everything from work emails to the main form of payment online and in stores. To illustrate just how dominant these services are, WeChat accounts for almost 30 per cent of all time spent using mobile apps each day. That’s 900 million hours every day. And unlike Facebook, which has seen its user growth slow to under 10 per cent in its more mature markets, WeChat grew 23 per cent in the past year to over 940 million monthly active users. That’s close to Facebook’s claimed 1.2 billion global users. QQ has more than 650 million active users across desktop and mobile. And then there are additional channels such as QQ’s QZone, Tencent Video, WeChat Moments and Tencent News, which all have hundreds of millions of users between them. 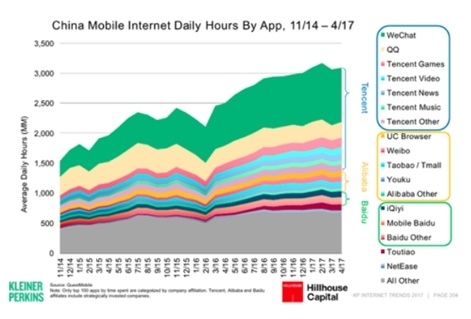 This chart from Kleiner Perkins’ Mary Meeker shows the dominance of Tencent’s different channels. 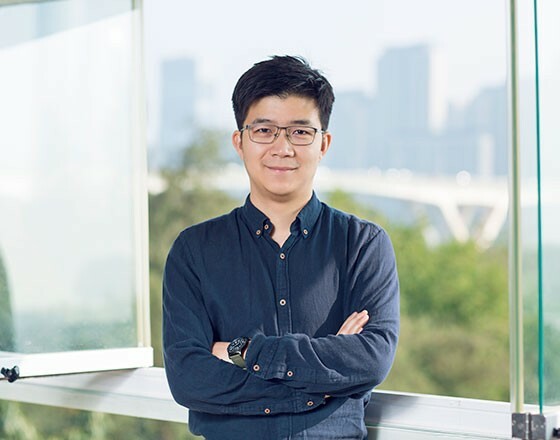 When it comes to launching and promoting an app on Tencent’s different channels, there is one overall platform that Tencent has created to address many different types of campaign. 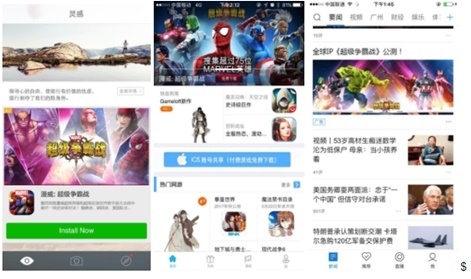 Guangdiantong is Tencent’s social advertising platform that allows advertisers to reach users of WeChat, QQ and QZone, as well as Tencent’s various apps (don’t forget that Tencent is also China’s most successful app publishers in its own right). QQ is the most popular social platform for younger users, whilst the profile of a typical WeChat user is slightly older. Of course, most Chinese consumers will have multiple accounts on multiple channels and apps, but you are still looking at a potential reach of 900 million consumers. To illustrate just how effective these platforms can be, earlier this year we were asked by Kabam to launch the movie-tie in game Transformers: Forged to Fight and also to promote the existing title Marvel: Contest of Champions. First launched in 2014, Contest of Champions was localised and launched in China last year. Kabam was looking to boost the installed user base, and generally get more people engaged in the game. Whilst we ran the campaign across various channels and apps from Baidu and Alibaba, Tencent was the major focus of the campaign. One objective was to encourage users to download the games and play the tutorial level – to show initial engagement past just an install – and another was to try and get them to continue playing past level five in the game. This was chosen as a benchmark as the time it takes to get to that point is a good indication of a player really liking the game, and so being more likely to spend on IAP. Some examples of the ad creatives we ran for Contest of Champions are below. As with any other UA campaign, we first worked to localise the creative, and think about what kinds of users we needed to target. In the same way that Facebook’s audience targeting tools are very powerful, Tencent’s ad platforms allowed us to quickly adjust our targeting to the point where we decreased the cost per install (CPI) by 40 per cent at the end of the first week. For Contest of Champions, there was a really positive response to the campaign, with a boost in the number of people playing the game past the tutorial and into the main game itself. Obviously, the biggest objective – to get more installs – was also achieved. On some of the Tencent channels we used, the conversion rate from the ads was as high as 30 per cent. The differences between China and other markets go much deeper than language and culture – Chinese consumers are huge users of social media and messaging apps. Because of the dominance of the big three companies – Baidu, Alibaba and Tencent – make sure you work with a local partner that has a good understanding of targeting campaigns across the different channels and apps. Think about the kind of game you are launching and the demographics of the gamer you want to reach. Although 91 per cent of Chinese consumers say they use social media every day, different platforms and channels are more popular than others, depending on age and interests. It’s well documented that Western publishers are obliged to use a Chinese subsidiary or local partner to publish in China. But there are also different legal requirements for advertising on different channels, which makes using an advertising partner with local expertise doubly important. It’s too easy to get caught up in red tape. The sheer scale of social media use in China is unlike anything anywhere else. Think the best part of Facebook’s entire user base, but in a single country. If Chinese consumers like something, it can become a massive hit virtually overnight.